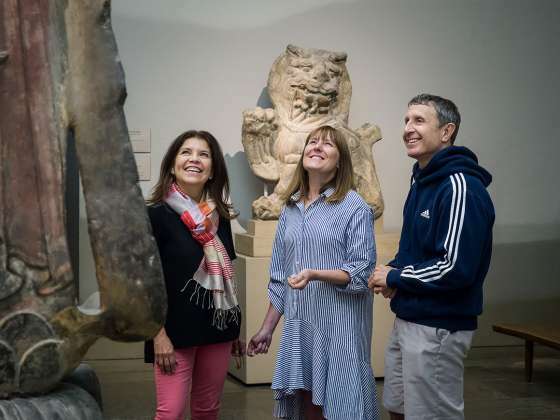 At the Museum of Fine Arts, Boston, students and teachers are invited to explore works of art spanning six continents and thousands of years of history. We offer innovative programs for students and teachers that encourage exploration of the MFA’s world-renowned collections and groundbreaking exhibitions. Connect your classroom to the MFA! For more information about bringing your school group to the MFA, see School Group Visits. For a list of tour options that are available during the 2018–2019 school year with Massachusetts curriculum frameworks connections, see School Group Options and Reservations. Plan a class visit or enjoy the galleries on your own! 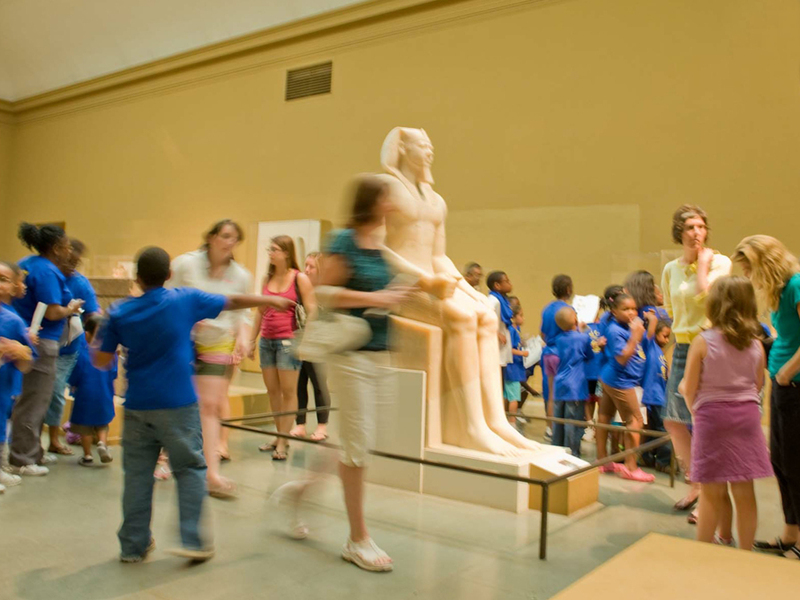 Receive free admission with proof of active teaching status in a K–12 school, afterschool, or community setting in Massachusetts, Connecticut, Maine, New Hampshire, Rhode Island, and Vermont. Visit any MFA ticket desk and present your current teacher ID or a letter from the principal or director on letterhead. You will also be asked to provide your e-mail address. Retired teachers and home school educators are not eligible. Not valid for additional chaperones on School Group Visits. For even more benefits, become an MFA Member with a $30 discount for teachers. Bring the MFA to your classroom! Schools within the I-495 corridor of Boston can schedule a museum educator to visit your classroom, while schools in any location can schedule a museum educator to virtually visit your classroom via a live, web-supported program. Learn more about Outreach Programs. The MFA offers workshops and training for educators throughout the year. For more information about upcoming opportunities, visit Teacher Professional Development. The MFA maintains longitudinal, dynamic relationships with individual schools and school districts. Learn more about School Partnerships. The MFA offers funding to assist schools in need that want to bring student groups to the Museum. Learn more about Bus Grants and Admission Waivers. Boston Public Schools and Lawrence Public Schools always receive free admission. To request a school group visit, see School Group Options and Reservations and indicate that you are a Boston or Lawrence public school when filling out a request form. The Lunder Maine Student Membership Program allows Maine students of all ages in public and private school, as well as home school students, to visit the Museum free of charge. To request a school group visit, see School Group Options and Reservations and indicate that you are visiting from a school in Maine when filling out a request form. The McLane Family New Hampshire Student Membership Program allows New Hampshire students of all ages in public and private school, as well as home school students, to visit the Museum free of charge. To request a school group visit, please see School Group Options and Reservations and indicate that you are visiting from a school in New Hampshire when filling out a request form. MFA School Programs are supported by the Smith Family Thinking Through Art Program Fund; the Germeshausen Foundation Fund for Youth and Family Learning; the Louise O. and Robert F. Levin Fund for Innovation in Teaching; the Edwin S. Webster Foundation Fund for School Programs; and the Bernard J. Rothwell School Bus Fund. MFA School Programs are supported by the School Programs for Lawrence Public Schools Fund; the Gallery Instructors and Gallery Instructor Associates Fund for the Partnership with the Boston Public Schools; the Ulf B. and Elizabeth C. Heide Education Fund; the Mabel Louise Riley Fund for School Programs; and the Gloria and Irving Fox Fund for Education. MFA School Programs are supported by the Education of Children in the Museum Fund; the Patricia and Robert Lawrence Fund for Education; the Dorothy Wagenknecht Fund; the Morton P. Prince Fund; and the Seth Sprague Educational and Charitable Foundation Fund. Presented with support from The Rabb/Goldberg/Cahners Fund for Teacher Resources, and the Louise O. and Robert F. Levin Fund for Innovation in Teaching. With additional support from Susan and Michael Haley, and the Brennan and Cianciolo Family Fund in memory of Vivian Monaco. The Lunder Maine Student Membership Program at the Museum of Fine Arts, Boston is generously funded by The Lunder Foundation. The McLane Family New Hampshire Student Membership Program allows New Hampshire students of all ages in public and private school, as well as those who are home schooled, to visit the Museum free of charge. MFA for Educators is made possible through the generous support of the William Randolph Hearst Foundation. The Gallery Instructor Program is funded through a generous endowment by Marcia and Louis Kamentsky. Support is also provided by the Bascha Snyder Education Fund, the Grace S. Dane Fund, and the National Docent Symposium Gallery Instructors Fund for Professional Development. K–12 educators in New England receive free admission to the MFA every day! Show your school ID at the admissions desk.